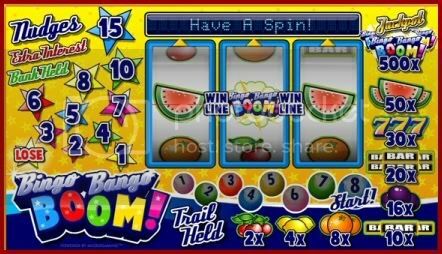 It’s fun, it’s fruity, it’s the popular pub slot Bingo Bango Boom! And Streak Gaming and River Belle Online Casino are inviting you to give the game a go with £5 free! This 3 reel, 1 payline video slot lets players create 9 winning payout combinations and boasts thrilling features such as nudges, holds, bonus games and free spins. Besides the £5 free and River Belle’s generous 100% match up to £100 free sign up offer, the player who wagers the most on Bingo Bango Boom by June 14, 2010 will also win £25! Now that’s a big bonus boom! Offer for UK players only! This Promotion will end on the 14th of June. Good luck and Have Fun Streakers!!! This slot look so cool!